Making its first girls' basketball state tournament appearance in 31 years, Stillwater made a run all the way to the Class 4A state championship game with leadership from three players who made the all-tournament team. Led by Sara Scalia, Alexis Pratt and Liza Karlen, the second-seeded Ponies steamrolled Shakopee in the quarterfinal round before outlasting and outmaneuvering Eastview in the semifinals. Stillwater's run came to a halt in the finale, however, as it dropped the title game to Hopkins. Scalia, a Minnesota commit, was the Ponies' scoring- and assist-leader all season. 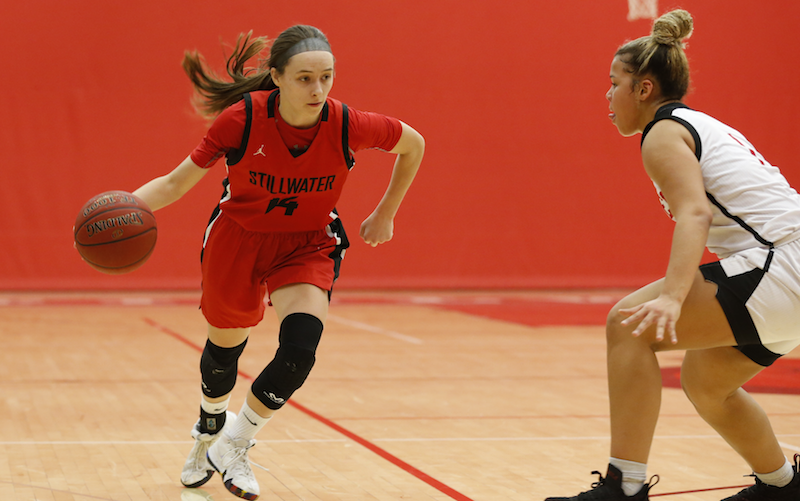 She capped her senior performance with a 19.3 points per game average in three state contests, including a team-best 24-point effort in the championship game. Scalia was a perfect 13 of 13 from the free-throw line in the tournament. Pratt, a sophomore guard, averaged 14.3 ppg and 4.3 assists per game in the Ponies' three state tournament contests. Pratt had six steals in the tournament. The Ponies' rebound-leader for the regular season, Karlen, showed her value in the paint throughout the tournament. Averaging 9.0 rebounds per game, Karlen pulled down a total of 27 boards in the tournament — notching 13 in the opening round win against Shakopee — and added nine blocks to the Ponies' defensive efforts. The Royals finished with a perfect 32-0 record to win its seventh crown in 15 years. Hopkins also boasts three all-tourney selections in Paige Bueckers, Dlayla Chakolis and Maya Nnaji. This year's all-tourney teams are presented by Wells Fargo and the Minnesota State High School League. Click through the tabs below to see who made the all-tournament teams in each class.